More than a quarter of primary care doctors reported being "burnt out," in part due to worsening time pressures and a chaotic work pace, which were "strongly associated with low physician satisfaction." The United States loses the equivalent of at least one entire medical school class (approximately 400 physicians) each year to suicide. In other words, 300-400 doctors in the United States kill themselves every year, or roughly 1 per day. Male doctors have suicide rates 1.4 times that of the general population, while female doctors have twice the rate of depression and 2.3 times the suicide rate when compared with women who are not physicians. Help for Today's Tense, Frustrated Doctors. Medscape, 2009. 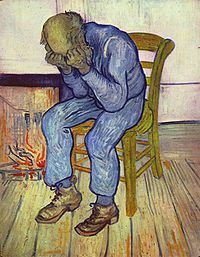 Image source: Vincent van Gogh's 1890 painting At Eternity's Gate. Wikipedia, public domain. that's it??! just one per day??! Well, even one per day is too many. The incredible amount of pressure on us primary care physicians is often undescribable, to do SO much more with less time, and more indirect/invisible work. It's definitely not an easy life we choose for ourselves, is it? Suicide rate of dentists used to be very high at the beginning of the century. It improved after better equipment was introduced. A lot depends on the work conditions and stress at work.